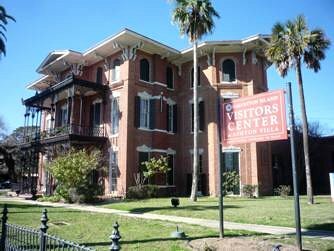 The Aston Villa Galveston was built in 1859 on the eve of the civil war. It is the oldest historical landmark on Broadway street. It was built by James Moreau Brown, a wholesale hardware merchant, railroad corporation president and banker. Brown was one of the richest men in Texas in those days. The mansion is filled with antiques, furnishings, paintings, art objects, textiles, original art works and family heirlooms. Ashton Villa Galveston provides the opportunity to take a glimpse into the life of an affluent Victorian family. A guide is at hand to give interesting historic information that span several countries. Make sure to visit every room. The ladies parlor upstairs is place to see. Currently the tour day is on Saturday at 2 p.m., 3 p.m., and 4 p.m.
$23 for a family pass (two adults and up to three students under 18), and free for kids 0 to 5. Aston Villa 2328 Broadway Galveston, TX 77550 For more information, call 409-762-2475.